There are waste items that should NOT be placed in either of your household garbage or recycling bins. If you are not sure, please look over our A-Z of waste page. There are correct recycling and disposal methods for paint, chemicals, e-waste, mobile phones, batteries, community sharps, fluorescent tubes see below to find out the correct way to dispose of these items. These items generally contain chemicals or toxins that have heavy metal contaminants so disposing of them in landfills can create an environmental hazard. It is therefore important to dispose of these products correctly. These items can be dropped off for free at Salamander Bay Waste Transfer Station Community Recycling Centre or alternatively at a Chemical Clean Out. 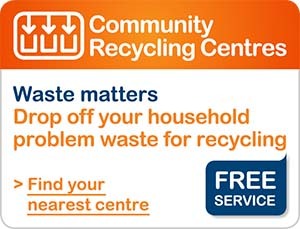 For more information download the Community Recycling Centre brochure (PDF 397KB) for items accepted, or visit the chemical cleanout brochure (PDF 1.8MB) for the next dates near you. 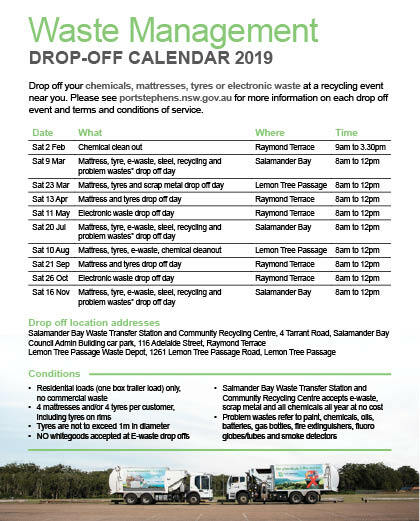 Download the 2019 Waste Management drop-off calendar (PDF 23kB).